Creative Commons? Commercial? How do Image Uasge Rights even work? As constant creators and people who continuously work to churn out pixel perfect image after image – it’s important to know the rights behind each form of content that we publish. It’s also quite important to respect the published works of other people. Every avenue that we display our work on has different attributions in their terms of service, and when you deal with visuals – its important that these terms aren’t foreign to you. Curtis Newman of the blog – The Visual Communication Guy – has made a very easy to use flow chart to help you if you’re stuck! 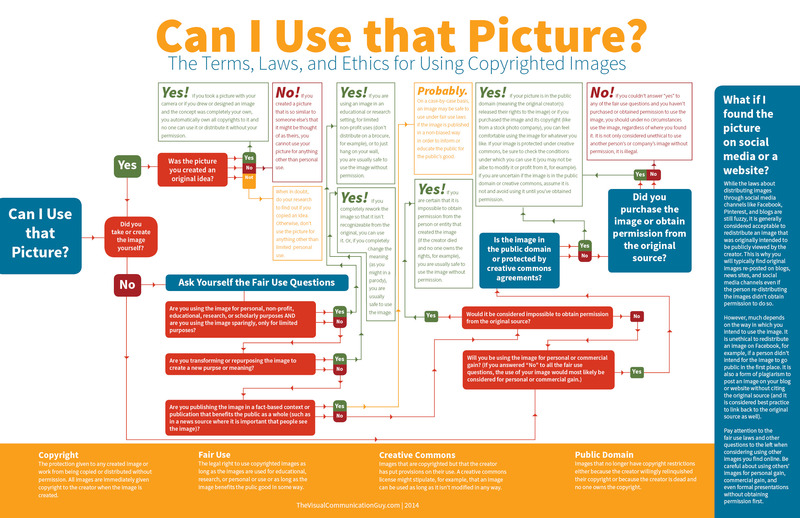 The reality is, though, as long as you become familiar with four terms–copyright, fair use, creative commons, and public domain–you’ll have a pretty good idea what you can and can’t do with images. If it’s all new to you, spend most of your time learning the fair use clauses. That’s where the ambiguity in copyright laws exist. As with most laws, the ambiguity is for our benefit, but it sure can make copyright laws fuzzy at times. My rule above all else? Ask permission to use all images. If in doubt, don’t use the image! Did you learn something from this post? Feel free to share it out! You can let us know by leaving a comment below. You can also hit us up on our Facebook, Twitter and Google+ profiles. Lastly, our RSS Feeds is open for subscription so that you can stay creative!